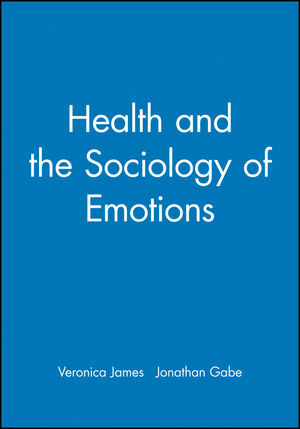 Health and the Sociology of Emotions offers an appraisal of the current lively debates which challenge the contribution of the sociology of emotion to health, and of sociology of health and illness to a sociological understanding of emotion. Veronica James is Professor Nursing Studies in the School of Nursing and Midwifery, University of Nottingham. Jonathan Gabe is Senior Research Fellow in Medical Sociology in the department of Social Policy and Social Science, Royal Holloway, University of London. Introduction (Veronica James, University of Nottingham; and Jonathan Gabe, Royal Holloway, University of London). 1. Biomedicine, holistic health and the emotionally reflexive body in "late" modernity (Gillian Bendelow and Simon Williams, University of Warwick). 2. C. Wright Mills meets Prozac: the social emotions approach to an understanding of health and illness (Margot Lyon, Australian National University, Canberra). 3. Plans, intentions and emotions: reflections on a methodological problem encountered in a study of teenage pregnancy (Andrew Finlay, Dorothy Whittington, Nicola Shaw and Monica McWilliams, Universities of Dublin and Ulster; Northern Health and Social Service Board). 4. Is there a reciprocal relationship between emotions as expressed in first person fieldwork accounts and the sociology of emotion? (Liz Young and Ray Lee, Royal Holloway, University of London). 5. Emotional labour, order and emotional power in care assistant work (Geraldine Lee-Treweek, University of Manchester). 6. Social construction of emotion and health promotion: the case of nursing (Pam Smith and Abigail Masterson, RCN Institute of Advanced Nursing Education). 7. Trust, uncertainty and consumerist models of health care delivery (Deborah Lupton, University of Western Sydney). 8. Exploring emotional expression in medical examinations: a transcript-based analysis (Bill Yoels, University of Alabama at Birmingham). "The observations made here support the editors' view that the sociology of emotions and the sociology of health and illness have much to offer each other. Considered together, they open up new avenues of thought and the prospect of some enlightening medical studies." * A unique combination of theoretical perspectives with case studies in one volume. * Established and new authors.